Pinterest is the latest word in social media and is used across the board for creating interesting and exciting pages, known as pinboards. These boards are essentially like virtual pinboards (rather like the type you would have had on your kitchen wall or on the back of your fridge in the good old days), which allow you to comment and share images and boards with your followers. Pinterest allows you to associate your social media accounts, such as Twitter and Facebook, with the website and therefore enabling you to ‘like’ and ‘repin’ those ‘pins’ which you fancy out to your social network. The visual element of this ‘pins’ and boards make this application the perfect addition to the must have website memberships for those looking for inspiration for their interior designs. Effectively, one could create a scrapbook of ideas using the thousands of images which users ‘pin’ from around the world. By categorising these into rooms using boards (e.g. bedroom ideas, lounge ideas, etc), ‘pinners’ could build out a virtual house of ideas and redesign every room in their property. 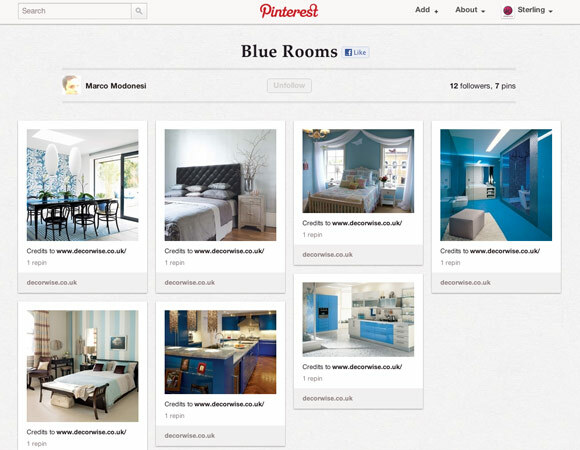 Pinterest has a wide variety of interior designers using the pins. The wonderfully clear layout of the pins and the fact they can create such an attractive image, means they really can offer some great ideas for those looking for interior design inspiration. There are a number of inspiring Pinterest boards out there that offer you images and also advice below in the comments box. You should look to follow these high profile designers to gain access to their pins and truly inspirational boards. The fact pinboards can be made up of any particular niche, or of any broad sphere means it is possible to meet a wide range of design tastes and create pins of a certain style. These can then be shared across communities and social media in an easy manner, meaning great ideas have the opportunity to travel fast and reach many people. Most companies that have sites which are largely orientated towards visuals, such as those in the interior design realm, or ecommerce fashion and home websites, will have Pinterest boards, to ensure they can make the most of the products they are selling, or designing (and of course, the link building benefits which they gain from using the application). The visual element can pair items beside each other, which complement each other as well as show whole ideas for rooms and areas, all on one board. Ideas can be added to the images that are ‘pinned’ via comments and people can link to and pin certain pictures to their board, creating a collaborative environment and inspiration for their own interior design from the boards. All of this means it is a 21st century way of engaging, getting great ideas and making the most of your home. Pinterest not only can be utilised as a great source of inspiration for home interior design, but also as a place to find suppliers of materials, along with guidance from those top interior designers and bloggers whose ideas can become part of your own via this valuable new tool. Pinterest is still a ‘by invitation only’ website which makes it seem all the more special – look out for your invite and grab it to get access to all that it has to offer. Dawn Anderson enjoys Pinterest, interior design and blogging and is currently working with Top Tradespeople, website where you can compare quotes for home improvement from local tradesmen.